working to help Great Lakes communities safeguard clean drinking water sources. Over the past 15 years, The University of Toledo has built tremendous depth and breadth in research related to the health impacts of harmful algal blooms. With this expertise, faculty and researchers at the University are taking steps to ensure the Great Lakes region is protected for generations to come. UT assistant professors in Cardiovascular Medicine, David Kennedy, PhD and Steven Haller, PhD, are investigating the effect of algal toxins in persons with pre-existing liver disease and reconsidering levels of exposure considered to be safe. April Ames, PhD and Michael Valigosky, PhD, assistant professors in UT’s Department of Occupational and Public Health, are further examining the effects of recreational and work exposure to algal blooms through water-based activities such as swimming, fishing and boating. 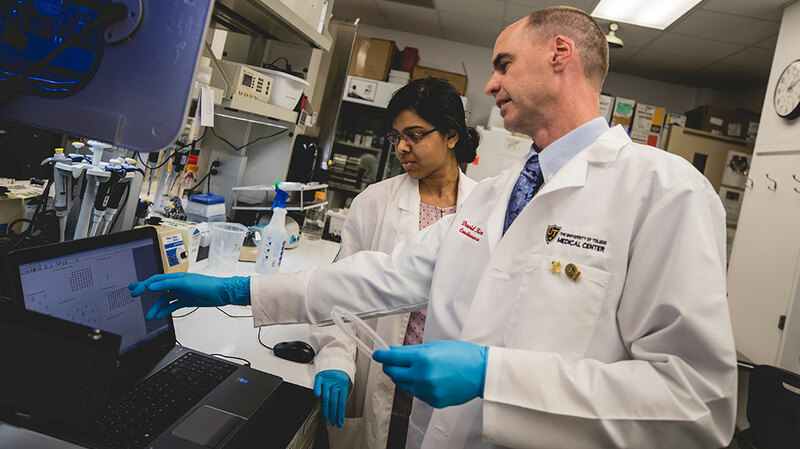 UT Associate Professor of Chemistry and Biochemistry, Dragan Isailovic, PhD is working to develop a lab test for detecting microcystin exposure through biological samples and measuring how much remains inside the body following exposure.